Days before the marathon I was trying to guess my current state of fitness so that I can plan my pace for the race. I looked at my workout diary and thought that I should run at an even split pace of 5 minutes per kilometer and expect to finish in 3:30 to 3:36. It's a wide ballpark I know but I have no idea how the start would turn out with so many runners in front of me. 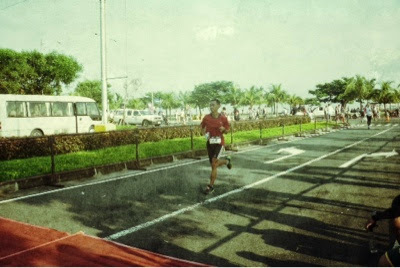 A day before the marathon I checked in at Microtel Inn and Suites beside Mall Of Asia - the start line. I watched the horror movie 'Annabelle' before dinner and went to bed at 11 p.m. I woke up 1:45 a.m. and was at the start line 4 minutes before gun start. I talked for a bit with a couple of acquaintances from GRC Toshiba Triathlon Team. Then we're off to a slow start - a walking start ugh. There were just too many runners that jam the road so I had to weave though human traffic before getting a clean road ahead, after 5 kilometers and more than 5 minutes lost. At that point I settled with my intended pace of 5 minutes per kilometer, luckily a guy in front of me was doing the same thing and he's quite on the dot kilometer after kilometer. Talk about an instant pacer, hah! One thing I noticed was that my legs didn't feel as robust as when I did a 21K even though I was running at a slower pace. But by kilometer 16 I was much settled in and enjoying the run in that pace. I thought I'll just let the time pass by and make adjustments after 33K. At approximately kilometer 26 disaster struck, I went looking for a porta potty and someone told me to head back a few hundred meters and I'll see some toilets. I didn't like the idea of running towards the back without the assurance of a tissue paper so I searched for a convenience store and found one with a toilet room beside it. I probably lost more than 25 minutes over there and felt drained afterwards. The succeeding kilometers were painfully slow, I was resigned to just chat with a fellow walker but decided to run again when he told me I can leave him cause he's decided to just walk most of the remainder of the course. We were actually talking about a race in Nuvali where he wasn't able to join and where I came out on top - talk about bragging while limping hehe. I covered the remaining distance uneventfully; bordering on boredom I jogged in shorter strides until I saw the finish line and pretended to run strong. I smiled for the camera and even smiled bigger when the photographer recognized me somehow and said "sir you're Pinoy Triathlon aren't you?" Haha yup that's me and thanked him before posing for another photo op. The good - I know that when ready and well trained I think I can hold a 5:00 pace. The bad - It seemed I still don't know how to tackle the cold when my shirt becomes all too sweaty. I think this was the reason why that disaster struck. The ugly - tied the shoe laces too tightly and suffered a swollen foot, never got to cut the nails causing my toes to hurt really good. 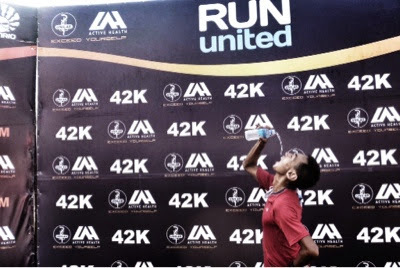 The RUPM race - it was well organized with hydration stations and kilometer markers well placed.